The word ‘radiation’ sparks immediate fear, but how worried do you have to be about the radiation in your microwave? Microwave ovens revolutionised cook by utilising microwave radiation to heat food quickly and safely. The waves react with molecules inside the food causing them to vibrate very quickly, this vibration creates heat and allows you to enjoy nice, hot food. If your microwave is in good condition, there is little to no worry about the radiation waves. All microwaves are manufactured under strict instructions, which pertain to controls against the microwave leaving the enclosed space and coming into contact with the tissue in our bodies. But, if a leakage does occur it needs to be attended to right away. Microwave leakage occurs when the unit itself is damaged. Common areas of damage include the door, the handle or the latch. These areas are vital in containing the radiation, so if they are damaged, they need to be attended to right away. Damage in a home setting is rare. But, microwaves in a business setting are subject to much more wear and tear. The door is slammed over and over again, and it’s unlikely staff will take as much care with the company-bought oven as they would their own. Other causes of damage usually revolve around not following manufacturer instructions. You should only heat food in microwave-safe containers, and you should be careful about heating liquids as they can heat past the point of boiling and explode. You also have to avoid ever placing metallic objects in the microwave as that will cause sparking and even fire. In Australia, microwave testing in a business setting needs to be carried out in accordance with AS/NZS 60335.2.25 and AS/NZS 3760:2010. The first aspect of the testing should be a physical inspection for damage. This inspection should focus on all aspects of the door and the opening mechanisms including the hinges, latch and handle. A proper test will also use a radiation-testing device to check the area surrounding the microwave for leakage. Radiation does dissipate as soon as the microwave is switched off, but as soon as it is switched back on the radiation can begin to fill a room. Microwaves are powered by electricity, so they need to be checked for electrical safety too. That means checking the power cords, the power point and conducting a full test and tag service before checking it off and declaring it safe. Consult the manufacturer instructions before drawing up a ‘Microwave Usage’ fact sheet. This information should be displayed near the microwave and rigorously enforced. Fill your workplace kitchen with microwave-safe cookware, so staff aren’t forced to use alternatives that could increase the risk of leakage. If a microwave door doesn’t fully-close, or appears damaged or warped it should be removed from the kitchen right away. Checking the opening and closing mechanisms should be included as part of daily safety checks. Instruct staff to stand a distance away from the microwave. Ovens should never be leaned on. The manufacturer instructions will contain advice on how long food and drink should be heated for, as well as instructions on what should never be placed inside the oven. Never operate a microwave oven while it is empty. Put staff members in charge of cleaning the microwave oven, or ask cleaners to pay special attention to it. You need to keep the cavity clean, and ensure the edge of the cavity is kept free of debris. You can do this with water and a mild detergent. Never use anything abrasive, like scouring pads or steel wool as these can crate little pits and cracks where leakage occurs. Why Opt for Professional Microwave Leakage Testing? As a business owner or manager, you are entirely responsible for ensuring the safety of your workplace. 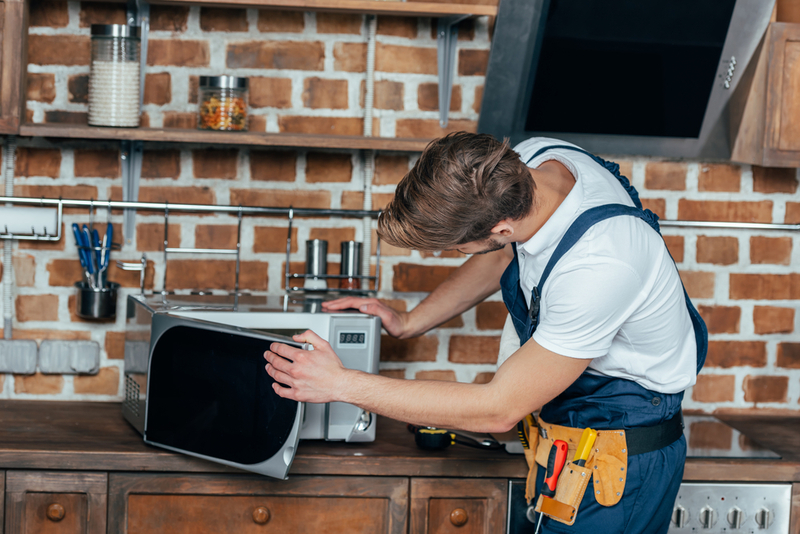 If you fail to do so, you will be held responsible under law, so microwave leakage testing is the only way to protect your workers, yourself and your business. In fact, this form of testing can be included as part of a wider compliance management, which focuses on delivering an electrically safe workplace by systematically checking off all appliances and systems. You don’t have to do a thing and you can rest easy in knowing that you are in charge of a workplace that is complaint and focused on worker safety.